Last night I saw this film at the Magnolia. It was screening as part of the AFI Dallas Film Festival. It’s pretty obvious from all the salmonella and e-coli outbreaks that our food is not safe. This movie shows why in disgusting detail — from cows who wade knee-deep in manure their entire miserable existence to a processing setup that allows beef from a thousand cows to end up in a single burger. Is chicken as appetizing when you know it’s been genetically engineered to have breasts so large it’s organs fail and it’s legs break when it tries to walk? The part I knew least about was how litigious and secretive food producers have become. Just a few companies process the vast majority of what we all eat, and they appear to have ruined many people’s lives in their efforts to silence critics and protect their business interests. It has a tobacco-like feel to it. The issue of cost came up a lot. Better food no doubt costs more. I like cheap food too. But something one farmer said struck me as true — if you don’t buy the cheapest car, why would you buy the cheapest beef? Why do you care if organic, free-roaming eggs are $3 a dozen if you are willing to buy a $3 latte? It’s not surprising that this has a similar feel as Al Gore’s “Inconvenient Truth,” as the director said the same group of people produced it. I predict this movie, which opens in wide release in the summer, will be much bigger. Not everyone believes in global warming, but we (nearly) all eat the same burgers. Duchesse de Brabant, originally uploaded by espeedy123. 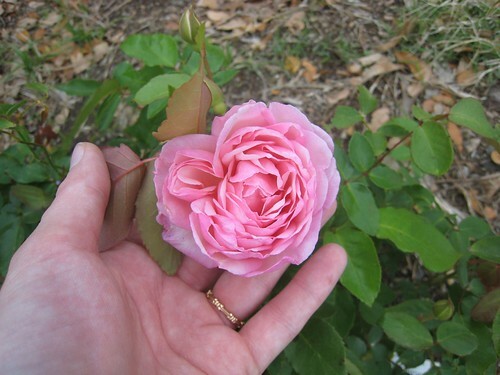 This fall I planted five different types of “Earth Kind” roses in my front landscape, all of them pink. I already had one in the ground from the year before, and it did so well I gave her some friends. Earth Kind is a classification awarded by the Texas A&M Extension, and it means the rose is easy to grow and doesn’t require pesticides, fungicides or a ton of fertilizer. Teddy Roosevelt made this rose his favorite, often wearing a bud or flower as a boutonniere. It is very nearly our greatest favorite, too. The cupped pink flowers have a cabbagey roundness to them, as if they were picked from a luscious old rose painting. Nearly continuously in bloom, these roses can be counted on for a rich whiff of fragrance at absolutely any time of the day, even in the hot Texas sun. The apple green leaves are slightly wavy. About a year ago I was shopping at a local plant nursery when I heard about an underground video. The topic — how to grow the most tomatoes in Dallas, Texas. The expert on the video, the source told me, was a man who was a member of the First Men’s Garden Club. This master tomato-grower had passed away a few years ago, but his technique was legendary, and this video documented his secrets. Earlier this week I had the good fortune to finally see the program. It was played at a meeting of the First Men’s Garden Club. The film had a Dharma Intiative quality to it. I felt I was seeing something important, historic and also secretive, just like the Oceanic Six lost on that crazy island. The video details how John Walls produced over 1,300 pounds of tomatoes per season in three 24-foot double rows of tomato plants. Amazing, right? There was no smoking gun or magic potion. Just a carefully engineered and highly disciplined approach that created perfect growing conditions for an extended period of time. 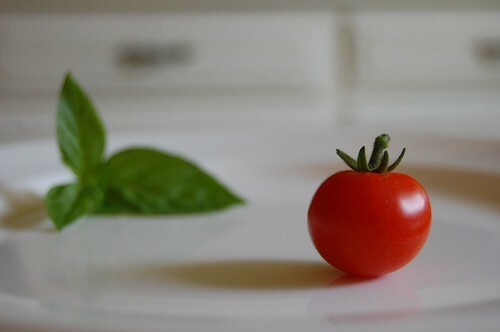 Many people mistakenly think the growing season here in Dallas for tomatoes is quite long. Not true! Tomatoes need temperatures to be around 65F at night and 85F during the day to set fruit. Once we get into June and July when nighttime temperatures rarely dip below 80F, most plants shut down the production lines. The time window for the ideal temperature range is quite short here. To extend that range, Mr. Walls got started early. He prepped the raised rows with compost, and he covered them with black plastic. For each plant he would cut a hole out of the plastic just over a foot in diameter. It’s my understanding this plastic kept the soil temperature higher than normal. This reminds me of the Earth Box, which you may have encountered. He built a long, makeshift wood frame along the rows and covered its pitched roof with 3 mil plastic sheeting. Along the midline of each row he ran one PVC tube that looked to be about an inch in diameter. For each plant he drilled a hole about 45 degrees down from the top of the pipe, such that when a hose supplying the tube was turned on, it would create an arc of water right that hit right at the base of the plant. Each plant had a cage built from concrete reinforcing mesh. He planted transplants level with the ground, not super deep as so many people around here suggest. In the hole he added a spoonful of cheap tomato food. Near the base of the transplant he added a cupful of granulated sugar and about the same amount of Epsom salt. Where the water flowed near each plant he inserted a single multivitamin. He watered thoroughly at the beginning and end of each day only when the ground two inches down felt dry. He was meticulous about keeping the rows clean, and the pathways between the rows he kept neat by covering them with roofing paper. I am sure there were a few more details there but that’s the heart of it. I put some tomatoes out this week and will share what tips from the other portion of the lecture in a future post. David Yates, Erin Covert, originally uploaded by espeedy123. I recently started joining David Yates for the full three hours on the Saturday radio program “The Home Improvement Zone.” We take calls and “go beyond sticks and bricks with the issues that matter to you….” as the announcer says. It is huge fun. 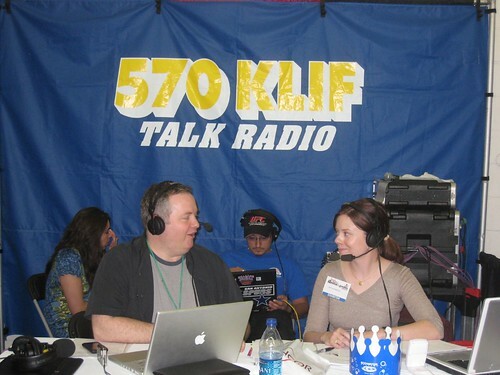 Recently we’ve aired from the Home and Garden shows in Arlington, Dallas and Ft. Worth, interviewing various experts. In this photo we are at the Dallas Exposition Center, in between the rubber broom booth and the succulent society or something. Honestly I love going to the shows and had gone to both the Arlington and Dallas ones in years past. Lots of good stuff to see! I have a lot to learn about sounding as smooth as David, and I appreciate him having me along.